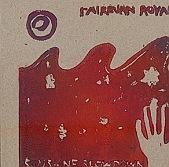 The Fairburn Royals' Sunshine Slowdown is aptly titled. Much like a day, it offers up warm, delicate-ness, in the form of pop music, but as it progresses it gets a bit darker, slipping into night. But when night comes, instead of getting cold and dark, it stays warm and relaxed, preferring to have a bit more of a rock edge than all-out melodic pop.